Understanding behavioural dynamics in pigs is important to assess pig welfare in current intensive pig production systems. Agent-based modelling (ABM) is an approach to gain insight into behavioural dynamics in pigs, but its use in applied ethology and animal welfare science has been limited so far. We used ABM in a case study on tail biting behaviour in pigs to explore the use of ABM in gaining more insight into emergent injurious pig behaviour and related welfare issues in intensive production systems. We developed an agent-based model in Netlogo 5.1.0 to simulate tail biting behaviour of pigs housed in conventional pens in groups of 10. Pigs in the model started as neutral pigs (not involved in biting incidents), but could change into a biter, victim, or both biter and victim. Tail biting behaviour could emerge when pigs were unable to fulfil their internal motivation to explore. The effects of a redirected exploratory motivation, behavioural changes in victims and preference to bite a lying pig on tail biting patterns were tested in our model. The simulations with the agent-based model showed that coincidence in development of a redirected exploratory motivation can lead to tail biting behaviour in pigs and can explain the strong variations in incidence of tail biting behaviour observed in conventionally housed pigs. Behavioural changes in victims and preference to bite a lying pig seem to be of minor importance in the causation of tail biting patterns. The behavioural time budget of a pig might be an important factor in predisposing pigs to or preventing them from becoming a tail biter or a victim. ABM showed to be useful in analysing behavioural dynamics and welfare issues. An advantage for ABM in applied ethology is the availability of data from empirical studies. On-farm tail biting prevention in long-tailed pigs – results from a producer questionnaire in Finland. By Valros, A., C. Munsterhjelm, L. Hänninen, T. Kauppinen, M. Heinonen, 2016. Royal Dublin Society: Abstracts book of the 24th International Pig Veterinary Society (IPVS) Congress, Dublin, Republic of Ireland 7-10th June 2016. p. 144. Introduction: Tail biting is a serious welfare problem in pigs, causing substantial economic losses. In the majority of the EU countries, tail docking is used to reduce the incidence of tail biting. However, many of the risk factors for tail biting are related to suboptimal management, and tail biting can be reduced by corrective management decisions. There are few studies on which preventive measures producers themselves value as most important. Materials and Methods: A questionnaire was distributed via slaughterhouse webpages in 2015. Producers were asked to score the importance of handling different tail-biting risk factors on their own farms, as well as about which manipulable materials they use, and find efficient. In addition, we asked about their opinions on tail biting and tail docking. A total of 70 producers replied, 54 of these replies were regarding fattening pigs, and 16 regarding weaned pigs. The size of the pig units varied between 100 and 6400 pigs, with an average of 1307 pigs. Finland banned tail docking in 2003, so all farms raised long-tailed pigs only. Results: On average, the producers reported a prevalence of tail biting of 2,3% on their farms, which corresponds well with values reported at Finnish abattoirs. Most producers found tail biting not to be a big problem on their farms and 62% of the farmers found it very unlikely that they would raise tail docked pigs even if it was legal in Finland. The more tail biting reported on the farm, the more problematic the farmers found tail biting, and the more prone they were to say they would probably tail dock if they were allowed to. According to the Finnish producers, the most important factor to prevent tail biting is that there is enough feeding space for the pigs. Altogether, four feeding-related risk factors were included in the top-10 measures to prevent tail biting. Also pig health was considered very important, as well as a good quality of piglets, and controlling air movements in the pen. Straw, newspaper, hay and cardboard were considered the most efficient manipulable materials to prevent tail biting. If tail biting has already started in the pen, the producers ranked identifying and removing the tail biter from the pen as most important, followed by adding bedding-type manipulable materials. Conclusion: The results are partly in accordance with experimental and epidemiological studies on risk factors for tail biting, but the high focus on feeding-related and health factors is interesting. Finnish farmers appear to handle the tail docking ban well, and do not, on average, find tail biting a very serious problem. 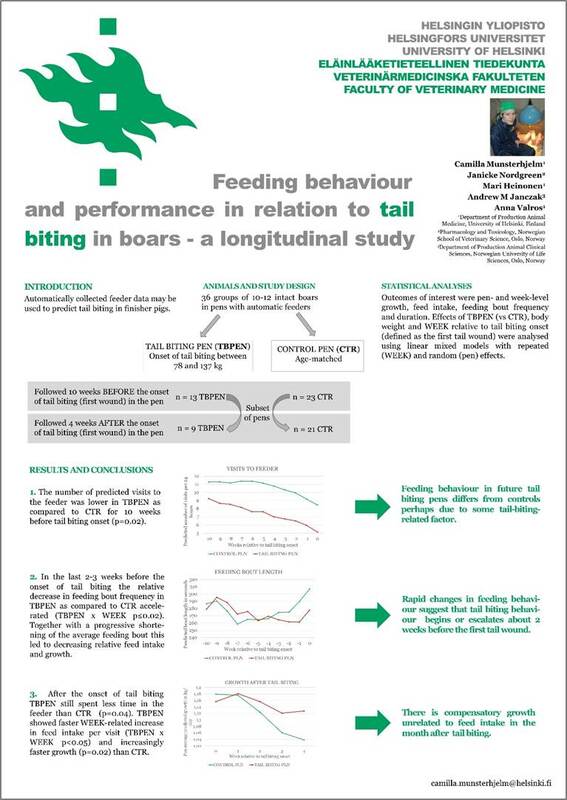 Feeding behaviour and performance in relation to injurious tail biting in boars – a longitudinal study. By Munsterhjelm, C., J. Nordgreen, M. Heinonen, A. M. Janczak, A. Valros. 2016. 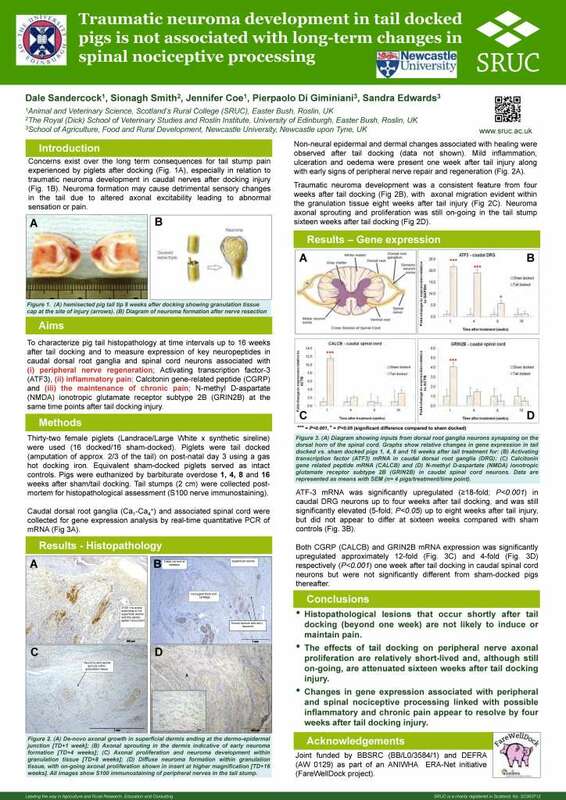 Royal Dublin Society: Abstracts book of the 24th International Pig Veterinary Society (IPVS) Congress, Dublin, Republic of Ireland 7-10th June 2016. p. 627. Introduction: Automatically collected feeder data may be used to predict tail biting in finisher pigs. 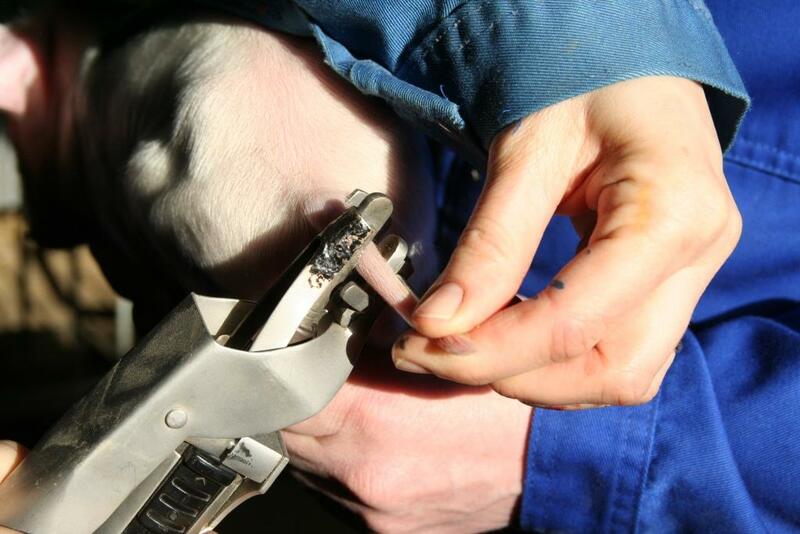 Materials and Methods: Pen-level feeding behaviour and growth were investigated in relation to injurious tail biting (ITB), defined as visible wounds, from 10 weeks before to 4 weeks after the first ITB case in the pen. The data set included 36 pens of 10-12 intact boars between 43 and 148 kg, with average pen weight at ITB onset between 78 and 137 kg. A tail biting pen (TBPEN) had at least one case of ITB, whereas a control pen (CTR) had none. Individual feeding-related data including consumed feed, bout length and -frequency were collected by a single automatic ad libitum feeder. Time (week) relative to ITB onset was referred to as RELWEEK. The time before (PRE-ITB, RELWEEK -10 to 0, n=13 TBPEN and 23 CTR pens) and after ITB onset (POST-ITB, RELWEEK 0 to 4, n=9 TBPEN and 21 CTR) were analysed separately. Effects of TBPEN (vs CTR), bodyweight and RELWEEK were analysed using a linear mixed model with RELWEEK as repeated and pen as random effect. Results: PRE-ITB the number of predicted feeder visits was lower in TBPEN as compared to CTR and decreased with age (PRED = -18 to -39% at RELWEEK -10 to 0; TBPEN effect p=0.02), leading to a tendency for a shorter daily time in the feeder (TBPEN effect p=0.06). TBPEN showed a growth dip to a -11% PRED level in RELWEEK -9 (TBPEN x RELWEEK p=0.001). Feeding behaviour changed in TBPEN in RELWEEK -2 to 0. Significant TBPEN x RELWEEK –interactions (p≤0.02) indicated that the relative decrease in the number of feeding bouts accelerated. Together with a progressive shortening of the average feeding bout this led to decreasing relative feed intake and growth (PRED= -10%, -7% and -8% at RELWEEK 0, respectively). POST-ITB TBPEN still spent less time in the feeder than CTR (TBPEN p=0.04), whereas the difference in the number of visits was decreasing (TBPEN x RELWEEK p<0.001). There was a tendency for a higher intake per second (TBPEN p=0.08) and a significantly faster RELWEEK-related increase in intake per visit (TBPEN x RELWEEK p<0.05), as well as increasingly faster growth (PRED= +9% at RELWEEK 4, TBPEN p=0.02) in TBPEN as compared to CTR. The amount of feed consumed did not differ. Conclusion: Changes in feeding behaviour in TBPEN 10 weeks before ITB suggests presence of some tail-biting related factor. A growth dip 9 weeks before ITB may indicate the involvement of health problems in tail biting. Rapid changes in feeding behaviour suggest that tail biting behaviour begins or escalates 2 weeks before the first tail wounds are detected. TBPEN shows compensatory growth unrelated to feed intake in the month after ITB onset. Temporal changes in mechanical nociceptive thresholds in juvenile pigs subjected to surgical tail amputation: a model of injury induced by tail biting. By Di Giminiani, P., E. Malcolm, M. Leach, M. Herskin, D. Sandercock, S. Edwards, 2016. Royal Dublin Society: Abstracts book of the 24th International Pig Veterinary Society (IPVS) Congress, Dublin, Republic of Ireland 7-10th June 2016. p. 649. Introduction: Tail biting is a global welfare problem in the pig industry leading to significant tail injury and potential carcass rejection. The temporal effects of such injuries and subsequent healing are presently unknown, although limb amputation in humans can lead to abnormal neural activity and decreased nociceptive thresholds. In order to evaluate potential sensitisation following tail damage, we created a model by surgical amputation of tails, and assessed mechanical nociceptive thresholds. Materials and Methods: Surgical tail resection was performed to assess the influence of age, extent of tail amputated and time since amputation on thresholds of mechanical nociception. To evaluate the effect of age at the time of injury, female pigs underwent surgery at 9 weeks (±3 days ‘weaner’) (n=19) or 17 weeks (±3 days ‘finisher’) (n=43). The effect of time after amputation was evaluated on 24 pigs at 8 weeks, and 38 pigs at 16 weeks after surgery. The effect of the extent of tail amputated was assessed by assigning the pigs to 3 treatments (‘Intact’: sham-amputation; ‘short tail’: 2/3 of tail removed; ‘long tail’: 1/3 of tail removed). A Pressure Application Measurement device was used to record mechanical nociceptive thresholds (tail flick or tail clamp withdrawal responses). Within a single session, three stimuli were applied to a skin area proximal to the site of amputation, 3 days pre-surgery, 1 week and either 8 or 16 weeks post-amputation. 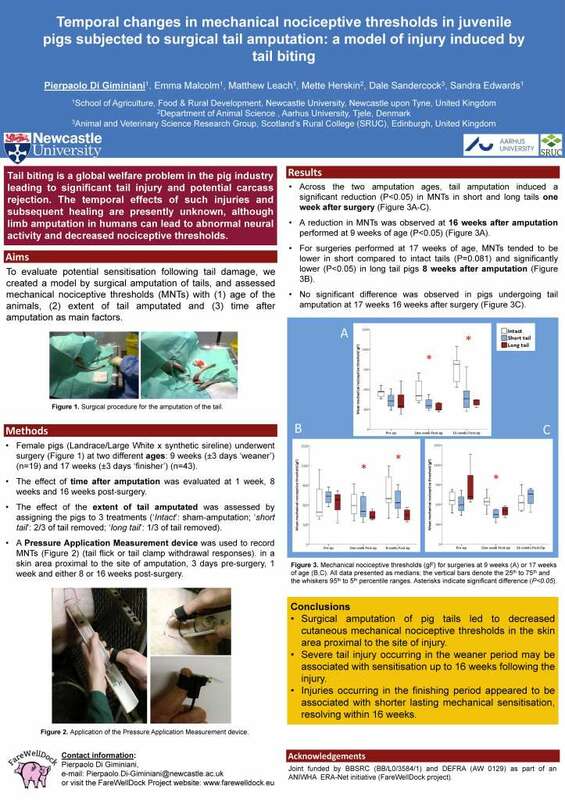 Results: Across the two amputation ages, results indicated that tail amputation induced a significant reduction (P<0.05) in mechanical nociceptive thresholds in short and long tails one week after surgery. The same treatment effect was observed at 16 weeks after amputation performed at 9 weeks of age (P<0.05). For surgeries performed at 17 weeks of age, thresholds tended to be lower in short compared to intact tails (P=0.081) and significantly lower (P<0.05) in long tail pigs 8 weeks after amputation. No significant difference was observed at 16 weeks following surgeries performed at 17 weeks of age. Conclusion: These results show that surgical amputation of pig tails leads to decreased cutaneous mechanical nociceptive thresholds in the skin area proximal to the site of injury. Results indicated that severe tail injury occurring in the weaner period may be associated with sensitisation up to 16 weeks following the injury. In contrast, injuries occurring in the finishing period appeared to be associated with shorter lasting mechanical sensitisation, resolving within 16 weeks.